Circle BMW in Eatontown will donate $100 for every car sold during the month of October to the Perricone Center for Women’s Cancer at Hackensack Meridian Health Jersey Shore University Medical Center. 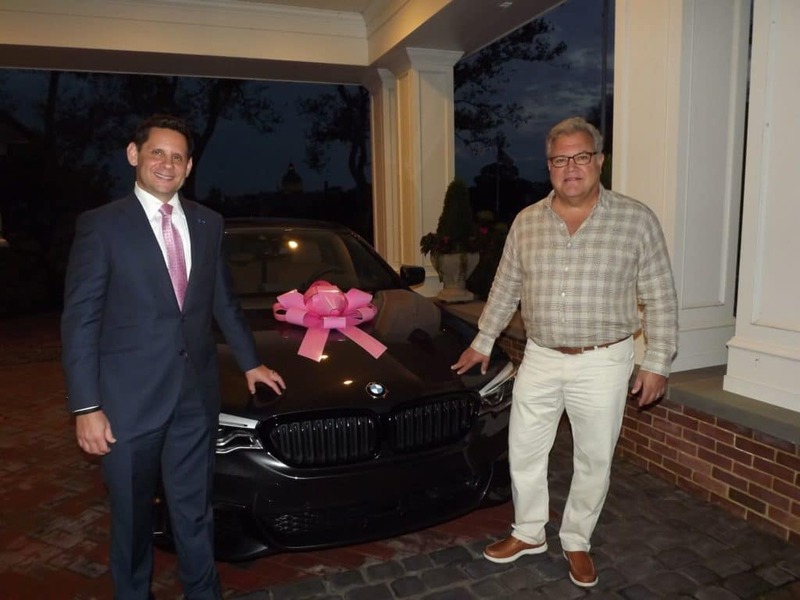 Pictured are Kenneth N. Sable, M.D., MBA, FACEP, regional president, southern market, Hackensack Meridian Health (left) and President of Circle BMW, Tom DeFelice (right). During October, National Breast Cancer Awareness Month, Circle BMW will donate $100 for every car sold, to the Perricone Center for Women’s Cancer located within the Cancer Center at Hackensack Meridian Health Jersey Shore University Medical Center’s new HOPE “Healing OutPatient Experience” Tower. Circle BMW will donate up to $10,000 and has set a goal to sell a minimum of 100 cars during October. The first two floors of the 10-story HOPE Tower are dedicated to cancer care, offering patients the latest in technology and treatment options, including: sub-specialist physician offices, infusion, radiation therapy, genetic testing, counseling and supportive care. And, as part of the most comprehensive health care network in New Jersey, patients have access to a clinical research portfolio comprised of precision medicine, transnational medicine, immunotherapy, cell therapy and vaccine development. According to the U.S. Department of Health and Human Services, breast cancer is the second most common kind of cancer in women. About one in eight women born today in the United States will develop breast cancer at some point in their lives. National Breast Cancer Awareness Month was established to raise awareness of early detection and promote mammograms, the screening test for breast cancer. To schedule an appointment at Circle BMW, call (732) 440-1200 or visit www.circlebmw.com.